Cheteshwar Pujara's scintillating double-century and an unbroken 272-run partnership with Ravindra Jadeja, who compiled a hundred, helped Saurashtra pile up a massive score against Maharashtra in Rajkot. 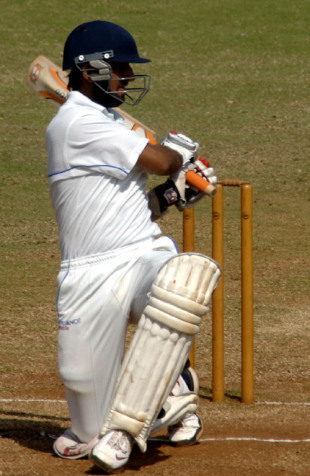 Resuming on 236 for 2, the hosts lost Shitanshu Kotak, but not before he completed his century. But an agonising day unfolded for the Maharashtra bowlers as Pujara and Jadeja treated them with utter disdain during their excellent fourth-wicket stand. Pujara's innings was studded with 22 fours and a six, while Jadeja hit seven fours and three sixes during his 189-ball stay. In reply, Maharashtra finished the day on 53 for 1, losing Harshad Khadiwale. Twin unbeaten fifties from KB Pawan and Amit Verma ensured a satisfactory day for Karnataka against Bengal in Mysore. Saurasish Lahiri's quickfire 37 was the only highlight for Bengal, as they finished on 324 from their overnight score of 252 for 5. R Vinay Kumar and Sreesanth Aravind were Karnataka's most successful bowlers, picking up three wickets apiece. Though Karnataka lost captain Robin Uthappa early during the reply, the third-wicket stand of 149 between Pawan and Verma gave Karnataka full control of proceedings, even looking good for first-innings points in this top-of-the-table clash. Piyush Chawla was the wrecker-in-chief as Baroda were bowled out against Uttar Pradesh (UP) in Ghaziabad. With no play possible on the first day, Baroda chose to bat but lost three quick wickets for 20. Azhar Bilakhia (35) put on a 57-run partnership with half-centurion Rakesh Solanki, before Chawla weaved his magic. Irfan Pathan boosted the total with a quick-paced fifty coming in at No. 7, and Chawla then proceeded to wrap up proceedings by the 70th over. The UP openers Tanmay Srivastata and Shivakant Shukla safely negotiated the 11 overs remaining in the day. How Punjab wished Murali Vijay had not been released from India's Test squad against Sri Lanka. The Tamil Nadu right-hander's sparkling century put them on top in Amritsar, as they emphatically strode to first-innings points. Once L Balaji had wrapped up the Punjab innings inside the first nine overs of the day, Tamil Nadu made light work of overhauling Punjab's total of 228. The 154-run opening stand between Vijay and Abhinav Mukund set the tone, before Vijay combined with Arun Karthik for another century stand. Vijay hit 16 fours and three sixes during his 218-ball innings. Legspinner Sarabjit Ladda (3 for 90) led the fightback for Punjab as they accounted for six Tamil Nadu batsmen, but the visitors' lead had crossed the 100-mark and threatened to increase more. Bhavin Thakkar's watchful fifty ensured Himachal Pradesh took first-innings points against defending champions Mumbai at the Bandra-Kurla Complex, even though they were cleaned up by Harmeet Singh and Iqbal Abdullah. Continuing from 100 for 3 the previous day, Thakkar steadied the innings even as wickets kept falling around him. However, Harmeet and Abdullah, who took four wickets apiece, could not prevent HP going past Mumbai's first-innings total of 162. Mumbai went about erasing the 84-run deficit in confident fashion as openers Sahil Kukreja and Ajinkya Rahane saw them through to the end of the day, putting on 53. HP offspinner Sarandeep Singh was no-balled for a suspect action in his third over of Mumbai's second innings, after which he was taken off the attack. Bad weather disrupted proceedings yet again in Hyderabad, as the home team could add just 34 to their overnight score against table-toppers Gujarat. Anirudh Singh brought up his fifty but was one of the wickets to fall, along with overnight batsman Syed Quadri. There were three pitch inspections at 11:00 am, 12:00 pm and 1:00 pm and play could only begin after 1:30 pm. But there was to be no post-tea session as play was called off at 3:11 pm. An unbeaten 78-run stand between wicketkeeper Mahesh Rawat and Krishnakant Upadhyay propped up Railways against Orissa in Bhubaneswar but rain played spoilsport, bringing a premature end to the day's play. A middle-order collapse resulted in Railways slumping to 219 for 8 from their overnight score of 176 for 4. However, bad light meant just 35.4 overs could be managed as Debasis Mohanty, who was the pick of the Orissa bowlers, finished with three wickets. Basanth Mohanty and Alok Chandra Sahoo gave him good support, picking up two apiece.